Introduction to your sport: When I was in Primary School, one of my educators enquired who would like to play Table Tennis. Naturally as I always put my hand up for all other codes of sport, I raised my hand. 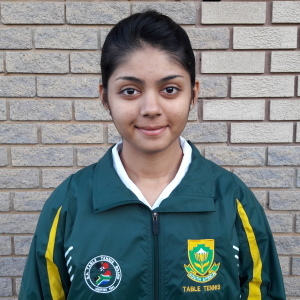 I eventually got selected to represent my school in the ward, and when I won the first school tournament, I was more motivated to excel at Table Tennis. I then joined a local club, and from there on i continued. – At the age of 16, selected to represent South Africa in the U18 division at the All Africa Games that took place in Algeria. Role Model: My Role model is cricketer AB De Villiers. I admire and try to replicate his character and personality. He is a humble and down to earth person, whose way of leading is exemplary. Even when his team loses he motivates them to do better. He trains hard, works hard, and has an optimistic outlook of life. How do you spend your down time? I love listening to music, shopping and enjoy reading. Importance of the EADP for you: In order for me to compete at the highest levels, I need individual coaching sessions, similar to my counter parts in the other regions. Currently I train in groups of about 15 to 20 kids, including development players. My hope is that with the little training time that I have, needs to be effective, as I have to juggle my time between academics and Table Tennis, hence the personalized coaching.